LAS VEGAS... 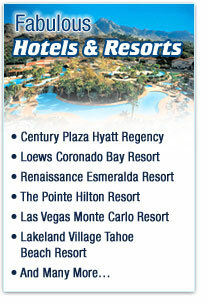 Check in for a fabulous stay on The Strip at the Monte Carlo Resort Hotel...enjoy the wave pool and Lazy River Float. Stroll down “The Strip” to see the Luxor, Treasure Island, Paris and Bellagio. Wander through the Forum at Caesar’s Palace before dinner at Planet Hollywood . Visit with the sharks, lions and tigers at the Mirage. 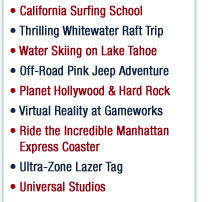 Experience the thrilling force of negative g's on the incredible “Manhattan Express” Roller Coaster at New York-New York Hotel and Casino. Close out your stay with state-of-the-art Virtual Reality at incredible Gameworks. GRAND CANYON... Look for the mighty Colorado River carving its way through solid rock. Hike the Bright Angel Trail to check out the most breathtaking sunset you’ll ever see! SEDONA... Buckle your seat belt for a wild Off-Road Pink Jeep trip. Ride the Broken Arrow Trail through magnificent Red Rock Canyons. SCOTTSDALE LUXURY RESORT... End your trip with a few days of “R & R’ at the fabulous Pointe Hilton Resort. Play tennis, work out in the health club and fitness center, or just enjoy the sun around the fabulous pool. In the evening we’ll cool off with great ice skating. The last night is our final farewell banquet dinner, and we jet home the next day with new friends and great memories.